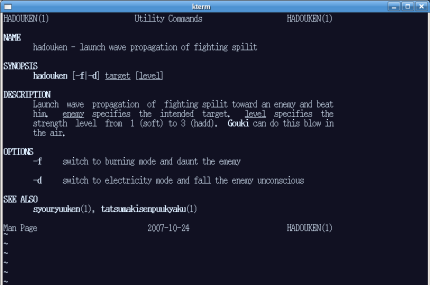 .TH "HADOUKEN" 1 "2007-10-24" "Man Page" "Utility Commands"
Launch wave propagation of fighting spilit toward an enemy and beat him. \\fIenemy\\fR specifies the intended target. \\fIlevel\\fR specifies the strength level from 1 (soft) to 3 (hadd). \\fBGouki\\fR can do this blow in the air.